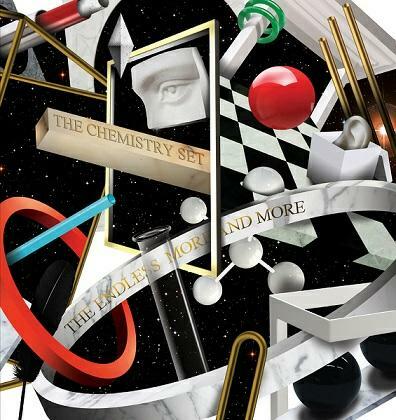 A little background for newcomers: UK psychsters The Chemistry Set got started back in 1987 during the Neo-Psych rage era, getting John Peel airplay and even appeared on Tony Wilson’s (Factory Records) TV show. They toured the UK, Europe and US before splitting in the 90s and then kick starting again in 2008. They’ve since released five 7″ singles on Fruits de Mer. And now we’ve got a killer set of 12 original songs, some of which appeared on the previous singles, that draw on a variety of Psychedelic and Rock ‘n’ Roll influences. I’ll hand it to The Chemistry Set… they have a compositional flair for melodic songs that hook you on the first spin. The musicianship, vocals, harmonies, production and arrangements are rock solid, creating a Psychedelic variety pack across these dozen tunes. I love the Pop-Psych grandeur of The Splendour Of The Universe, colored by Beatles/Revolver styled freak guitar and spaced out Floydian effects. Bouncy Sunshine Pop meets energetic Rock ‘n’ Roll on International Rescue. The Canyon Of The Crescent Moon has a similar spring in its step, but also a swirling Arabian vibe and the chorus reminds me of Soft Hearted Scientists. Time To Beathe is a slowly lulling Psychedelic crooner with wildly tripped out space guitar embellishment. Imagine turning Astronomy Domine into a lullaby and you’ve got something like this song. I like the Folk-Baroque sweetness of Winter Sun. Albert Hoffman is a Syd-like song that is, as you might expect from the title, laced with spaced out lysergic effects and a bonus grungy Psych guitar solo. Crawling Back To You sounds like a classic Paul McCartney fun time solo tune. Elapsed Memories alternates between haunting Psychedelic mysticism and Power-Pop. And speaking of mysticism, The Open Window goes full blown Indian raga for a cool grooving blend of mind-bending shamanic drone and Bluesy swagger in the vocals. The band get heavier rockin’ garage nasty on The Fountains Of Neptune. Dig that cool eerie organ and deep space swirl. Come Kiss Me Vibrate And Smile is similar but throws in some acoustic guitar jangle for a fun contrasting edge. And A Cure For The Inflected Afflicted is the heaviest rocker of the set, with 70s Hard Rock riffage and even a Blues harmonica fill. A solid set that grabbed me on the first listen and keeps on giving a half dozen spins later. The Endless More And More will be available in January. Note that this is a vinyl LP only release, limited to 600 copies in a gatefold sleeve with a fold-out periodic table poster. The promo sheet also announces that in late spring 2016 there will be a limited edition box set that will be housed in a ‘Chemistry Set’ box with experiments, test tubes filled with candy and assorted paraphernalia, plus a bonus 12″ featuring the band’s previously released cover of Hendrix’s Love or Confusion and two new remixes. Fun stuff indeed.